I Would Totally Adopt These Guys! I had the pleasure of seeing “Orphans” on Broadway this past weekend and absolutely loved it. I knew that the play would be leaving Broadway soon, so I had to see it and I did not regret it. 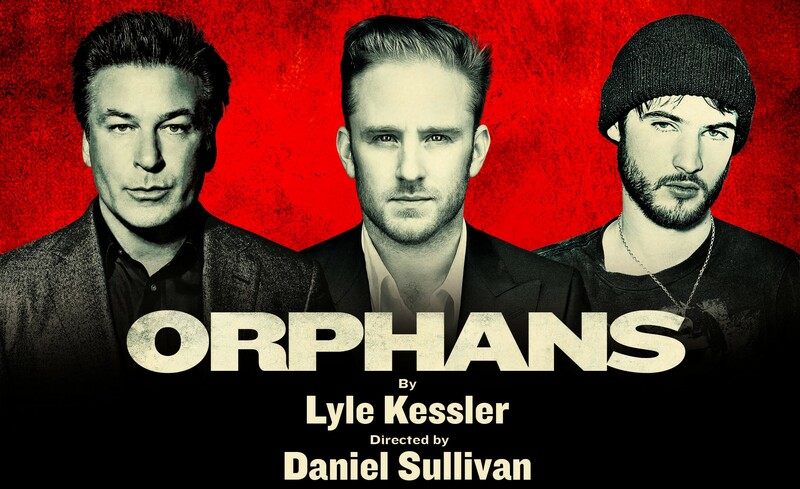 “Orphans” is a play written by Lyle Kessler and directed by Daniel Sullivan, starring Ben Foster as Treat, Tom Sturridge as his younger brother Philip and Alec Baldwin as Harold. Set in Northern Philadelphia, “Orphans” shows the viewer a glimpse of these three individuals at point in their life when they may need each other the most. Treat is excessively aggressive but has utilized his skills to feed his younger brother who can hardly take care of himself let alone get a job. Treat stumbles upon Harold at a bar and decides to kidnap him, especially after opening Harold’s briefcase and finding it loaded with stocks and bonds. After sleeping his drunk off, Harold comes to and subsequently releases himself from the bonds that Treat has tied him in, befriends Philip, and offers Treat a job. Harold sees himself as a father figure to these two individuals, promising them money, women, and security. Harold also sees a bit of himself in these two, as he is an orphan as well. “Orphans” will bring you to tears, split your sides, and make you really appreciate Alec Baldwin, Ben Foster and Tom Sturridge. Who, by the way, totally steals the show. Sturridge’s character resembles Arnie, Leonardo DiCaprio, from “What’s Eating Gilbert Grape”. Philip made the audience laugh while also offering his view on the situation. His desire to know exactly where he is, appears childish, at first, but once it is revealed becomes quite tragic. He is an orphan whose only family is his aggressive temperamental older brother who vacillates from hugging him to hitting him. Philip strives to have some control in his world and Harold offers this. Ben Foster was also quite good. Her appeared to be channeling his character from “Alpha Dog” who was just a crazy neo Nazi, but I could see that all over his character. An individual I went with, did not feel entirely convinced with his character and felt that he was either trying too hard or not hard enough. I felt that his character may have come across as unusual and difficult because his character was difficult. I believe that Foster had a good grasp on Treat, but that Treat himself was a difficult character. He wanted to be strong without acknowledging that he needed guidance, however, guidance was exactly what he needed. He was angry, happy, drunk, sad, and disappointed. His moods were difficult to predict and all over the place. Baldwin, I would say, didn’t shine within this play. He was good, but he wasn’t great. This may have been due to amount of stage time he had and the fact that a lot of his dialogue didn’t project. But his character was unusual. He wasn’t difficult to predict, like Treat, he was just weird. I apologize if I cannot describe his performance well, but it left me wanting. I wanted more from him. He was funny he was enlightening, but I felt like this was not his A-game. So if you could see this play, I would recommend that you do. If it is revived, you should definitely check it out.